Kenney Machinery Corporation, an Indianapolis-based Toro distributor, is pleased to announce that the new Toro turf maintenance and irrigation equipment recently unveiled at the 2016 Golf Equipment Show will be available for their Indiana and Kentucky customers during the spring season. 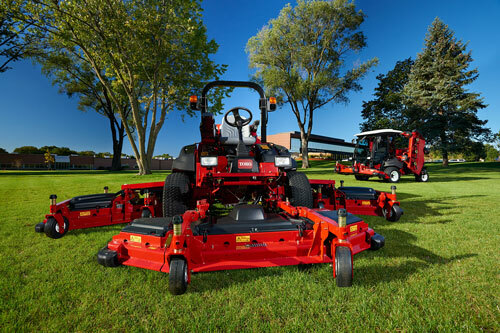 As a Toro distributor serving golf, municipal, and athletic customers in Indiana and Kentucky, Kenney Machinery Corporation has been trusted for nearly a century to provide the latest models of turf equipment available. They will continue this tradition in 2016 by ensuring that the many recently unveiled models of Toro mowers, utility vehicles, reels, and irrigation equipment are available for the spring season, allowing customers to take advantage of the latest technological advances in the turf industry. 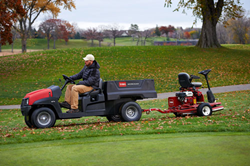 Kenney was speaking of the Toro Reelmaster 3555-D and 3575-D, and the new model of the popular Workman® GTX utility vehicle—all of which were introduced recently at the 2016 Golf Equipment Show in San Diego. The new Reelmasters offer a compact, lightweight design, quiet operation, and surprisingly impressive engine power. The new Workman GTX utility vehicle is more versatile than ever, with over 300 possible configurations including both two and four-seat versions. In addition to the new Reelmasters and the Workman GTX, Kenney Machinery will also carry the new Toro Greensmaster Flex™ 1820 and 2120, the Greensmaster® 3120, and the Tier 4 Final Groundsmaster® 5900/5910 mowers. All of these updated models of popular product lines incorporate new features designed to increase efficiency and reduce operating costs—such as fuel savings of up to 30% over previous models. When combined with the updated EdgeSeries™ Reel cutting units that feature longer-lasting materials and improved blade angle, these movers will truly deliver impressive results. Of course, turf has to grow before it can be cut, and that’s why Kenney Machinery will also offer several new Toro irrigation system products this season. These include the Lynx Smart Hub (which can manage as many as 1,000 sprinklers up to two miles away), the OSMAC G3 field controller (featuring a user-friendly interface which accommodates both scheduled irrigation and manual activities), and the Infinity Stealth sprinkler head (which allows turf grass to grow above the sprinkler head, minimizing disruptions to golfers). For more information about all of the new Toro products available through Kenney Machinery Corporation for the spring 2016 season, visit the Kenney Machinery website at http://www.KenneyMachinery.com or call 317-872-4793. Kenney Machinery Corporation is an Indianapolis Toro distributor providing sales and service throughout Indiana and Kentucky. Founded before the turn of the 20th century, the company has been a Toro distributor for over 70 years and has previously been recognized by Toro as the #1 turf equipment distributor. Kenney Machinery currently supplies new and pre-owned turf equipment to golf courses, municipalities, sports fields, and educational institutions throughout the region, and also helps customers maintain turf equipment using their unique Count On It Method™.